The butterfly bush is a large, arching and upright shrub that blooms profusely from midsummer through autumn. The butterfly bush produces fragrant, showy flowers that can be blue, red, pink, yellow or white, depending on the shrub variety. These lovely flower clusters attract butterflies more so than the flowers of most other landscape plants. Butterfly bushes are low-maintenance and most grow well in USDA hardiness zones 5 through 11, tolerating winter temperatures down to minus 15 degrees Fahrenheit. Water your butterfly bush deeply once each week during the spring and summer whenever rainfall is less than 1 inch. Soak the soil down to and around the butterfly bush’s root zone. Spread a 1-inch layer of organic compost on the ground around your butterfly bush once each year in spring. Spread on top a 2- to 4-inch layer of bark mulch to help control weeds and preserve soil moisture. Cut back the entire butterfly bush to about 4 feet tall each year in late fall. Prune back all old growth nearly to ground level once each year in early spring, before any new growth emerges. Trim to shape the butterfly bush in early June if desired and cut away any branches that died during the winter. Deadhead the butterfly bush’s flowers to remove the spent blooms throughout its blooming season. Deadhead the faded blooms from the bush once every week or two weeks to keep it blooming instead of producing seeds. Choose a planting site for your butterfly bush that's in full sunlight and has moist but well-draining soil. 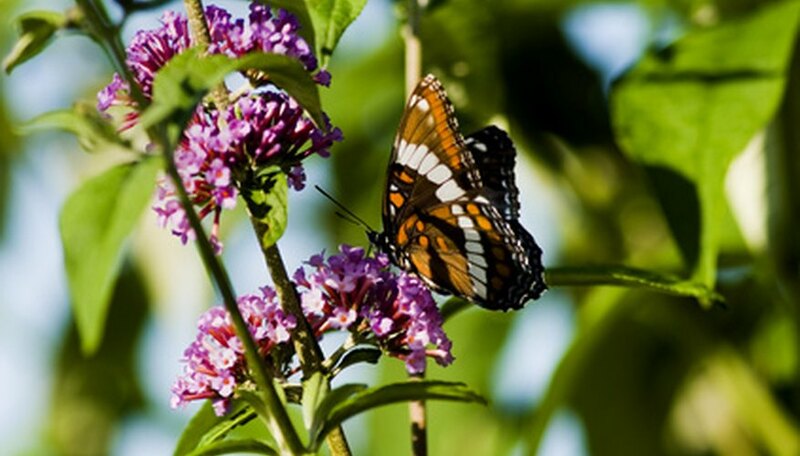 Plant the butterfly bushes in spring or fall, spacing the bushes at least 5 feet apart. When you're pruning the butterfly bush, always keep in mind that it blooms on new wood. Avoid removing new, healthy growth from the butterfly bush, because you'll also end up removing that year's flowers. ButterflyBushes.com: When and How Should I Prune My Butterfly Bush?